SUBHEAD: Japanese government approves dumping Fukushima Daiichi Nuclear Plant radioactive waste water into Pacific Ocean. 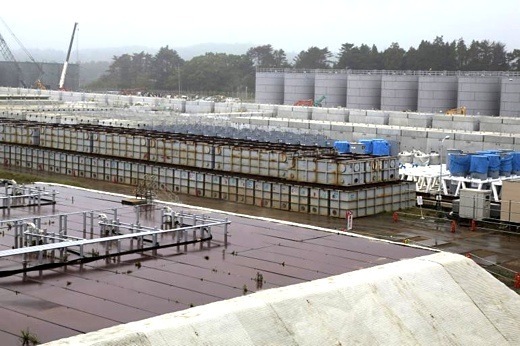 Image above: Tanks of radioactive water at TEPCO's tsunami-crippled Fukushima Daiichi nuclear power plant on June 12, 2013. From (http://www.ibtimes.com/fukushima-radioactive-water-leak-construction-giant-water-tanks-nuclear-plant-involved-illegal-labor). Regulators approve Fukushima wastewater drainage — Japan’s nuclear regulator has approved a plan by [TEPCO] to drain filtered wastewater from the firm’s crippled Fukushima Daiichi plant into the sea… The firm also plans to reduce the level of radioactive material in the water before releasing it into the nearby Pacific. On Wednesday, the Nuclear Regulation Authority approved TEPCO’s plan to install drainpipes and a pumping system and to reduce the level of radioactive cesium-137 to less than one becquerel per liter. Japan’s nuclear regulator has officially called on [Tepco] to work toward discharging low-level contaminated water… just two days after a worker fell into [a tank] used to store contaminated water… Tepco is using a processing system [that] is unable to take out the tritium [and] is reluctant to release it into the ocean to avoid… criticism from neighboring countries and some nations with a Pacific Ocean coastline… there is no detailed study about tritium’s long-time effect on animal genes. Mamoru Takata, a Kyoto University professor and expert on radiation’s long-term effects, said monitoring would be necessary to detect any worrisome signals. (50:00 in): It can’t be dumped into the ocean, because it’s completely unsafe because of these fission products. They have built over 1,000 large tanks, huge tanks… that contain this very, very radioactively contaminated water. At the moment they’re trying to filter out these fission products… It’s impossible for them to remove all those hundreds of radioactive materials. They know how to remove about 62 of them, but there’s other ones that they cannot. Can Bolivia leave capitalism's vice?